There are times when real life provides enough suspense, drama, and action that it can seem like fiction. 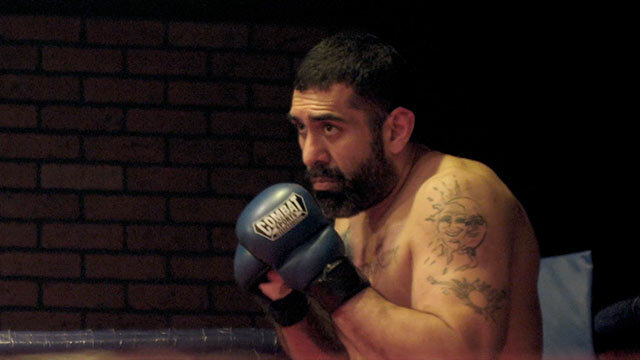 Throughout The Cage Fighter, I kept having to remind myself that the film was indeed a documentary, and that we were following Joe Carman’s real-life trials and tribulations. Director Jeff Unay presents Joe’s life masterfully, in a way that flows smoothly and tells a concise story. The film could easily pass as a fiction story created for the big screen, and the fact that it is real makes it all the more enjoyable. 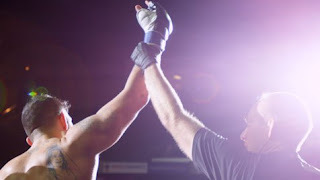 Joe Carman is a seasoned Mixed Martial Arts (MMA) fighter, with numerous fights on his resume. However Joe is much more than just an MMA fighter - he is also a husband, father of four girls, works in a boiler-room, and happens to be 40 years old. MMA has been a part of his life for decades and even though his body and family beg him to stop fighting, he is not ready to give it up just yet. Joe has made several promises to his wife and children that he will retire from fighting, promises that he keeps breaking. There is something inside Joe that makes him yearn to fight, so much so that he ties his self-worth to being in the ring. He does not want to upset his family, so everything related to MMA he now does in secret. He goes through a majority of his training at night, he doesn’t have the chance to have his family at his fights, and he tries to take care of his wounds without raising suspicion. Joe somehow manages to balance working long shifts in a boiler-room, trying to be a good father and husband, spending time with his family, and succeeding in a brutal sport that takes a tremendous toll on one’s body. Unay takes us behind the scenes of MMA, giving us a glimpse into a world where people are putting everything on the line to try and capture the glory of winning in the cage. Especially in Joe’s case, where he is competing against much younger men – some that may be close to half of his age. Competing at this age has earned him respect and admiration from fans, but is an ever-growing challenge. His years of fighting are compiling and he is beginning to see increasingly worrisome side effects from all of his past injuries. Joe takes longer to heal, and he suffers more severe side effects – including dizziness, loss of balance, and memory loss. The Cage Fighter shows us how much more is being put on the line than just Joe’s body. We see the devastation that his fighting is causing his family, tearing them apart at times. His wife has a chronic illness that doctors are struggling to identify, he is caught in the middle of a custody battle, and his relationship with his father is rocky (no pun intended) – at best. Yet none of that matters when Joe is training, preparing, and finally in the ring for a fight. Joe is an extremely likeable person, and it is nearly impossible to not root for him. The Cage Fighter successfully shows a different side of MMA, and gives the audience a chance to follow Joe’s incredible story – one nighttime training session at a time.